The incidence of all skin cancers continues to rise and the elderly are at particular risk. Squamous cell carcinoma of the skin generally afects older age groups, but both malignant melanoma and basal cell carcinoma are also commoner in the elderly than in younger age groups. In the UK, multidisciplinary guidelines have been published on the management of each type of skin cancer and are also available online.1,2,3 NICE has issued guidances outlining the referral pathways that should occur from primary care to secondary care, as well as advice on multidisciplinary team working.4 Cancer Research UK also provides a very good upto- date source of information on the latest trends in incidence and mortality of skin cancers.5 There are several different types of skin cancer. Some are very rare, therefore this review will concentrate on the three commonest types of skin cancer: squamous cell carcinoma (SCC), basal cell carcinoma (BCC) and malignant melanoma (MM). Basal cell carcinoma is the most common cancer not only in the UK but also in the rest of Europe, Australia and USA. Te incidence of BCC continues to rise worldwide, however, it is difficult to find accurate figures for the incidence of BCC in the UK. Estimates suggest that ofcial figures underestimate the true incidence of BCCs and there may be over 100,000 new cases each year in the UK. As the population of the UK continues to age the incidence will undoubtedly continue to increase and this increase has been predicted to continue for at least up to the year 2040. Genetic factors may occasionally be important such as in Basal Cell Naevus Syndrome (Gorlin’s Syndrome) where patients may present with multiple BCCs. There are many treatment options for the management of BCCs and the choice of these options will depend primarily on whether the patient has a low risk or a high risk tumour. Low risk tumours are those that are less than 1cm in diameter occurring on nonsensitive sites on the face and on the trunk and limbs. High risk tumours are generally regarded as those being close to the eyes and nose and which are larger in diameter or may have ill-defned edges such as the morphoeic type of tumour. Other factors which may be taken into account when deciding on the best treatment for an individual patient may include age, general health and medication (eg. warfarin and aspirin). Surgical excision is regarded as the gold standard treatment for most patients with BCCs. Cure rates of over 95% are usually achieved. Tere is some evidence that curettage prior to excision of a primary BCC may increase cure rates. The use of Mohs micrographic surgery can increase the cure rate even further, however this is a time consuming technique and is only available in specialised centres in the UK. Excision of a BCC is usually carried out under local anaesthetic and a peripheral margin of 4–5mm gives the best cure rate. If standard closure cannot be achieved then a more complex surgical closure using faps or skin grafs may be needed. If the BCC is incompletely excised in the vast majority of cases further surgery is indicated to ensure complete histological excision of the lesion as otherwise the recurrence rate is unacceptably high. Curettage and cautery is a destructive surgical technique, which may be useful for well defined low risk tumours. Fiveyear cure rates of over 90% have been reported in carefully selected patients. Curettage is much less successful for recurrent BCCs and is best avoided in this situation. In experienced hands, cryotherapy may be used to treat low risk and superfcial lesions, and in expert hands may be used to treat high risk lesions as well. Imiquimod is a relatively new immune response modifer which is licensed for the treatment of superfcial BCCs. 5% Imiquimod cream is applied to the lesion five days each week for six weeks. Signifcant infammatory reactions may occur and there is direct relationship between the degree of reaction and the cure rate. Cure rates of about 80% are being reported. PDT has been used to treat superficial BCCs with cure rates of approximately 80–90%. The treatment requires the application of a photosensitiser and exposure to an activating wavelength of light about three hours following the application of the cream. This treatment usually occurs in dermatology departments and the treatment time is about 10–15 minutes. The treatment can be painful but most patients tolerate it very well. Cosmetic results are very good to excellent. Radiotherapy is a very effective treatment for the management of BCCs and may be particularly useful for those patients who for one reason or another cannot be treated surgically. Te cure rates reported are about 90%. Long-term scarring may be a problem and if recurrence occurs then further surgery may prove difcult. The advice on management of BCCs has been reviewed recently and the new guidance was issued in early 2010. Te advice suggests that properly trained and assessed GPs will be able to manage low risk BCCs in certain circumstances, but that high risk lesions will need to be referred to a member of the local skin cancer MDT, usually a dermatologist.4 BCCs are excluded from the current government targets for cancers. Squamous cell carcinoma (SCC) of the skin is a malignant tumour, which is locally invasive and also has the potential to metastasise to other organs of the body. 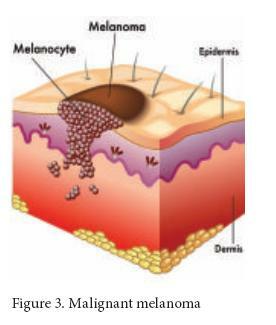 In common with other types of skin cancer the incidence is rising. In the UK, it is the second most common skin cancer with BCC being about four times commoner. Tere is a fairly direct relationship between the development of SCC and long-term sun exposure and most patients with SCC are elderly and fair skinned with a history of outdoor exposure, either through occupation or sport. Increasingly patients who are immunosuppressed following treatment with immunosuppressive drugs for organ transplantation are seen with aggressive and multiple SCCs. Patients who have been on immunosuppression for several years are at a very high risk of developing SCC of the skin and the risk has being calculated as being between 50 and 100 times that of patients not immunosuppressed. These patients, therefore, need to be given information at the time of their transplantation about sun avoidance and regular skin surveillance may allow early detection and treatment. Most patients with SCC have no further problems once their lesions have been removed surgically. 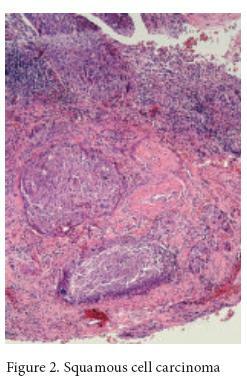 However, there is a possibility of metastatic spread and the risk is higher in tumours arising on sun exposed skin, those with a diameter greater than 2cm, tumours greater than 4mm in depth (tumours less than 2mm in depth are very unlikely to metastasise) and those that are poorly diferentiated. The primary treatment of any SCC is complete removal by surgery and this is the treatment of choice for the majority of patients with SCC. Tere should be a minimum of 4mm of normal skin around the tumour as narrower margins are likely to leave residual tumour. Tose tumours that are regarded as high risk may need wider margins of 6mm or more. Small, well differentiated, primary, slow-growing tumours may be removed by experienced physicians with curettage and cautery and there are some very good published results with excellent cure rates. Careful patient selection is essential and it should not be regarded as a first-line treatment for most patients. Again for small, well diferentiated tumours, cryosurgery may be an option in experienced hands, but should not be used routinely. Radiotherapy is an option for older patients with significant comorbidities where surgery may be difcult for a variety of reasons. Te cure rate from radiotherapy is said to be over 90% in carefully selected patients. Other treatments such as Imiquimod and PDT are unsuitable for treatment for patients with SCC. The aim of surgery is simply to excise the lesion in total with a clear histological margin. No further treatment is required. A 1cm margin of excision is considered safe and appropriate for these lesions. Most of these can be removed with a local anaesthetic. Te wound can usually be repaired leaving a neat linear scar. Most authorities recommend a margin of between 1 and 2cm for these patients, and certainly margins greater than this are not necessary. Excision margins of 2–3cm are recommended for these patients. Patients with lesions greater than 4mm in depth have a poorer prognosis. It has been recognised for many years that patients in this group have a high incidence of local recurrences if the margins are too narrow. A 3cm excision margin is therefore recommended; the wound will ofen need to be repaired with a skin graf, but this will depend on the anatomical site. Non-surgical treatments are occasionally used for lentigo maligna. These include cryotherapy, Imiquimod and radiotherapy. These treatments should only be considered in consultation with the skin cancer multidisciplinary team if surgery is not considered appropriate, or as part of a clinical trial. The technique of sentinel lymph node biopsy (SLNB) involves the identification and biopsy of the frst-station lymph node draining an afected area. Te SLN is found by injecting blue dye and/or radio-labelled colloid into the skin surrounding the primary lesion. Te technique enables the identification of patients with micro-metastases afecting the regional lymph nodes and can successfully identify the sentinel node in up to 97% of cases. Patients who are identifed as having micro-metastases are then submitted to a therapeutic lymph node dissection. There is general agreement that SLNB is useful as a staging procedure in patients with primary cutaneous melanoma. There are no randomised trials, however, that have shown any therapeutic benefit in patients who have undergone this technique. There may be additional potential benefits of accurate staging if adjuvant treatments, such as interferon, demonstrate proven benefit in patients with positive results. Adjuvant chemotherapy (including interferon) and melanoma vaccines have so far not proved to be efective in improving overall survival in primary cutaneous malignant melanoma. A recent meta-analysis has shown that adjuvant interferon has a small efect on overall survival and a signifcant impact on relapsefree survival, however this is of uncertain clinical relevance, and as the treatment is associated with signifcant toxicity, its routine use is still controversial. Although BCCs are very rarely fatal, it is important that they are treated correctly as the risk of recurrence increases with incorrect management and any subsequent scarring, especially if on the face, may cause considerable physical and psychological upset. It is important to remember that SCCs may metastasise and so the sooner they are treated and diagnosed the better, ofen early treatment is straightforward and curative. 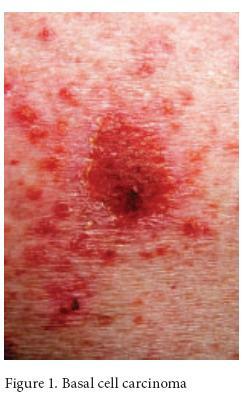 All pigmented lesions that are suspicious in any way should be referred immediately for an expert opinion, and if MM is diagnosed the patient should have the beneft of management by a MDT. Correct diagnosis, early referral and expert management will at least enable early efective treatment, reduce scarring and may sometimes be life saving.